I am sure everybody already heard that iPhone is currently the most popular camera on Flickr. As Chase Jarvis said already in 2009, “the best camera it’s the one with you”, people all around the world are recording their lives spontaneously using their cell phones. Also many professional photographers added mobile phone cameras to their tool bags, usually as an after-hours toy or to sketch images and save creative ideas. There is, however, a group of people who mastered the use of iPhones and create their photography solely using this medium, using it for post-processing, too. One of those people is Misho Barannovic, the author of recently released e-book by Digital Photography School titled “iPhone photography. How to shoot, edit and share great photographs.”. His photographs, taken with an iPhone, were printed in magazines and exhibited worldwide, proving that it is as much point-and-shoot for masses as well as a medium for serious art. 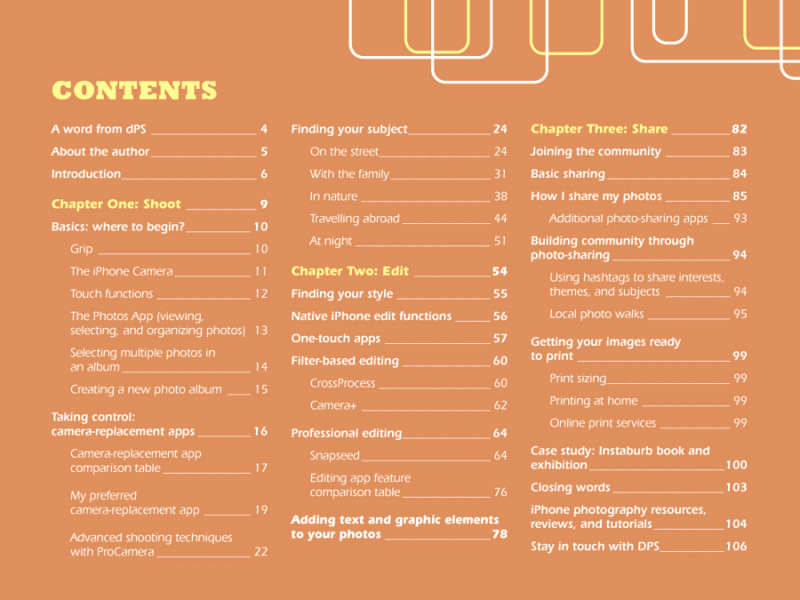 The 106 pages of “iPhone photography” feels like a missing manual to iPhone’s camera and apps expanding its capabilities. The e-book itself is divided into three parts, in turns discussing taking images, post-processing and sharing. To see in more details what you can find in the book take a look at the Table of Contents to the side (by clicking on the image you will see the larger version). In the first part, author talks about taking images with an iPhone, either with build-in camera app as well as many available alternatives. Here you can find the tips on proper steady holding your iPhone. And learn that image is not taken when pressing the trigger, but by letting go of it! I also really liked how the apps are compared in tables, with main features and price, to help make informed choices. It is followed by step by step instructions how to use the few most popular ones. The same systematic approach is taken towards the post-processing apps in the second part. After all, images taken in the spur of the moment should get processed right there, while the impression and mood are still fresh, to preserve it. Or change it completely… The more traditional post-processing apps, like Snapseed are discussed side by side with one-touch filter-based apps. Even more “advanced” techniques, like night photography, elaborate black and white conversion, creating HDR (High Dynamic Range)-type images or panoramas is covered. And on top of that, there is an app presented which adds text to your images. 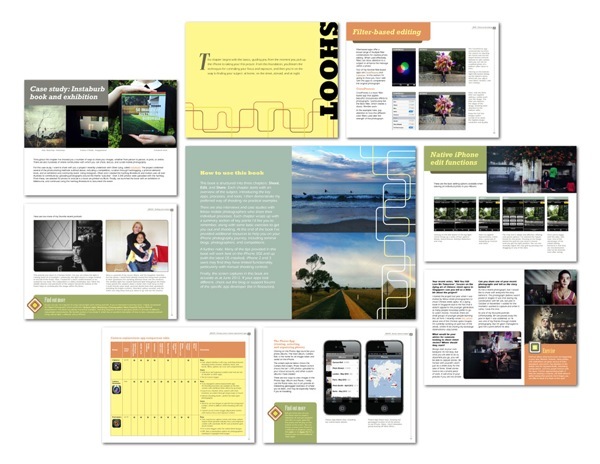 The third part is devoted to sharing your images, both on-line and as hard-copies. There are suggestions for photo labs, or printing at home. But the most stress is put on on-line communities on photo- sharing sites, like Facebook or Instagram, and great projects which can come up from those interactions. My favorite part of “iPhone photography” are interviews with eight photographers specializing in iPhone photography. Through short interviews, they share their tips and techniques, introduce additional apps I have never heard of, but most importantly- show how wide variety of subjects can be covered with an iPhone. There are photographers shooting street type of images, travel, portraits, even landscape. You can draw a lot of inspiration from them. There is also a lot of resources provided in “iPhone photography”– links to variety of apps, tutorials, articles, videos etc. From page to page you can see a lot of blue from hyperlinks. If you start exploring them, you would never be able to finish reading the e-book! Luckily, they are all collected at the end, for easy reference. What I find missing from the “iPhone photography” is extending the capabilities of the iPhone with accessories like lenses, tripods, or underwater casings, even it is just for fun. Also, the basics of photography like compositional rules or searching for the best light are not covered at all. 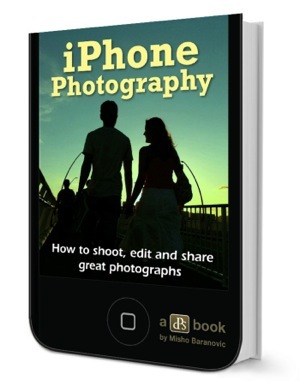 It is as if the e-book was directed towards people having some experience with photography. It does not take away much from the e-book in my opinion, though. There is so much value here, and I learned a lot myself. I have to admit that at the moments, I was following with amazement how many steps can come after the simple task of snapping the image with an iPhone before it ends up published on the net. It is like discovering the whole new world I did not new existed. I am sure it will be an eye-opener for many of you who have never tried using an iPhone for creating images. “iPhone photography” will help you quickly to get control over this simple camera and unleash creativity in totally different way then DSL would. You can purchase instant download of pdf and epub versions (yes, both come at the price!) of “iPhone photography” at special, launch price of $14.99 for a limited time by clicking here. It is 25% off the regular prices, so don’t wait for too long! 4 Responses to "Creativity simplified with “iPhone photography” by Misho Baranovic"